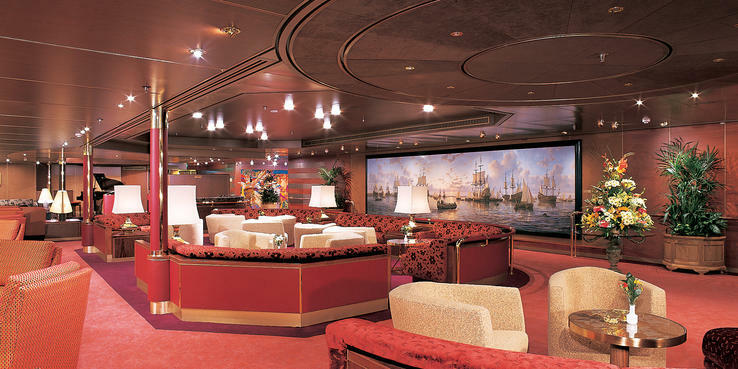 La Fontaine is the ship's cavernous, two-level main restaurant venue. Connected with a double sweeping staircase with gold trim lining the banisters, La Fontaine serves open-seating breakfast and lunch and a blend of set-seating and flexible, restaurant-style meals at dinner. Hours for breakfast in the main dining room vary but start as early as 7 a.m. on port days and 8 a.m. on sea days and wrap up by 9 or 9:30 a.m. Service ranges from incredibly efficient to slow, leaving most caffeine-withdrawn diners plotting how to flag down a waiter for that first cup of coffee. Breakfast fare included cereals, breads, blueberry pancakes, French toast, corned beef hash, yogurt parfaits and egg dishes. Portions were on the smaller side, so if you are especially hungry, definitely order a side of bacon or sausage, and opt for a second pastry. Lunch in the main dining room is typically limited to just an hour a day (noon to 1 p.m. on sea days; closed for lunch when the ship is port for an entire day). Therefore, you might see a line of passengers waiting to be seated. Don't be deterred; the line moves fast, and there are plenty of tables. Lunch fare includes soups, sandwiches, light salads, fish and some heartier entrees like beef stroganoff. In the evenings, passengers can opt for set dining times at dinner -- either 5:45 or 8 p.m. -- or open seating in the La Fontaine main dining room, anytime between 5:15 and 9 p.m. Open-seaters were on the first level, while those who committed to set times were on top. While you can make reservations, you probably won't have a problem getting a table as a walk-in, especially after 8 p.m. It's rarely an issue getting a table for two at any meal, and you will likely be asked if you want to join a larger party or dine on your own. That said, there aren't an abundance of tables for two, so if you want a seat by the window, you'll likely have to join a larger party of six or eight. La Fontaine's dinner menu is more varied. Some options are designated as "Greenhouse Spa Cuisine," and one night may include a salad of arugula with sliced pears and pistachios, and broiled pork medallions lightly topped with a red-onion and cranberry relish. Other dinner options include various soups, prime rib with glazed carrots, eggplant parmesan and the ubiquitous, but slightly disappointing, Caesar salad. (Opt for the Caesar salad at the Pinnacle Grill instead.) There are two salmon entrees each day, and the first night you may enjoy the salmon, topped with a pinot noir sauce. The wine list includes about 75 sparkling red and white selections. There are sometimes minor service missteps at dinner -- a missing napkin, the removal of a knife that's still needed -- but overall, the experience is good. The biggest dining disappointment of the week was the specialty restaurant Canaletto, Holland America's casual Italian restaurant, which serves dinner from 5:30 to 9:30 p.m. for $15 per person. Tucked away in a corner of the Lido Buffet, Canaletto, on my trip, was so new it wasn't even on the map given to passengers at the start of the cruise. In fact, many might not have even known about it, and that's probably a good thing until the restaurant finds its way. Cheery service got the evening off to a fine start -- a sign that you've arrived is the sight of waiters wearing black- and white-striped shirts and greeting you with "Buona Sera!" ("Good evening!" in Italian). The food, however, was a disappointment. The menu is populated by no-frills Italian dishes like spaghetti and meatballs, meat lasagna and minestrone soup. The chicken marsala with a side of steamed cauliflower, carrots and linguine with a tomato sauce was forgettable, and the seafood pasta was doused in too much cream sauce and had several mussels that weren't open. Desserts include a trio of tiramisu and several gelatos. We opted for the millefeuille, a layered chocolate cake, but it was dry, unimpressive and left on the plate, mostly uneaten. The wine list was limited but offered extremely good value with glasses at just $5 and bottles for $22. The buffet-style Lido Restaurant is always bustling during breakfast and lunch. For early risers, a Continental buffet opens at 6:30 a.m. (6 a.m. on port days) and runs until 11 a.m, offering standard fare like pastries, fruit and cereal. A full buffet with an expanded menu of pancakes, eggs, sausage and a made-to-order omelet station serves from 7 to 10:30 a.m., though hours can vary slightly on early port days. Lunch, served from 11:30 a.m. to 2 p.m. , offers a little more variety with a salad bar and different stations for Italian and Asian fare, along with made-to-order sandwiches. The deli and salad bar remain open throughout the afternoon until 5 p.m.
A less-crowded midday option: on deck near the Lido Pool, you can hit the grill for a hamburger or hot dog, grab a taco, or pick up a slice of pizza. It's open the entire afternoon. Finally, the Lido's ice cream bar proved to be especially popular with seemingly half the ship's passengers, who were carrying around waffle cones during the second full day at sea. To bypass both the Lido and the main dining room for breakfast, you can head to the Explorations Cafe -- a coffee bar that serves lattes, cappuccinos and other espresso drinks (but no basic drip coffee). There is a charge for these drinks, but at $2.60 for a double latte, it's a downright bargain compared to Starbucks. There are also pastries and mini-bagels with smoked salmon available at no charge. The Explorations Cafe is open from 8 a.m. to 10 p.m.
Room service is a great option for breakfast if you have an early meeting time for a shore excursion and don't want to risk a delay in the main dining room. Service is very prompt. Breakfast options included a selection of cereals, pastries, eggs and the standard early-morning sides like bacon and turkey sausage. The room service menu offered from noon to 10 p.m. is more varied with appetizers like shrimp cocktail and French onion soup, salads, sandwiches and handful of entrees that include a vegetarian-friendly pasta dish, along with desserts. And there's a 24-hour menu, as well; it's more limited but offers the basics, such as a mixed-greens salad with tomato and bleu cheese, club sandwiches, hamburgers, and chocolate cake with raspberry sauce, among other bites. The premium dining option on Amsterdam is Pinnacle Grill, Holland America's alternative restaurant. Pinnacle Grill is described as showcasing the food and wine of the Pacific Northwest, but it might be better framed as a classic steakhouse with a stellar Washington and Oregon wine list. At $35 per person for dinner, served from 5:30 to 9:30 p.m., and $10 for lunch, served noon to 1 p.m. on most days, it is worth it to have at least one meal there. You'll need to make reservations, and the earlier in the trip you do so, the better. At 8:30 p.m. one night mid-cruise, the restaurant was mostly full. There are also options for less carnivorous diners. Vegetarians may opt for the beefsteak tomato salad, drizzled with balsamic vinegar. The restaurant has a particular flair for tableside presentations. The Caesar salad is prepared by your waiter so you can specify your love (or hate) of anchovies, while the Steak Diane gets a fiery arrival with the addition of flaming cognac poured over the top. Desserts were a highlight, too. Order the chocolate souffle at the start of the meal, and don't make the mistake of agreeing to share it with your dining companion -- you will want to devour the entire dish! Just as impressive as the food at Pinnacle Grill was the wine list, populated by bottles from Washington and Oregon vineyards. It's a collection that I hadn't seen before, even in my wine-centric home base in San Francisco, and the varied list gave me the chance to try some new names. White wines by the glass range from $7 to $14 with many options from Washington producer Chateau Ste. Michelle. In case you've adapted the mantra of the merlot-hating character from the movie Sideways, this is your chance to change your take on that maligned varietal. There are 13 red wines by the glass, including six merlots, and I had a standout glass from maker Apex. The wine list was stepped up in price from the main dining room but was still reasonable for a special dinner. Bottles started at $29, and most were $89 or less. For a real splurge, the Cellar's master list offers a collection of 11 bottles, mostly French and Italian, with prices from $108 to $634. But, given the strong selection of Washington varietals, why not stick with local?